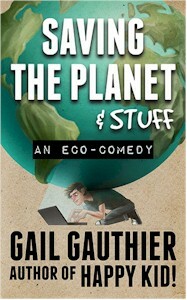 We have a cover for the e-book edition of Saving the Planet & Stuff. We've also had the book's text scanned, and we're in the process of checking the coding. We have part of a book trailer. We have a script for a vlog. We have marketing plans. Well, initial marketing plans. We have the short story that I wrote prior to Saving the Planet that dealt with the original situation that inspired the whole thing (a young person going on vacation with elderly strangers). I was pretty certain it still existed somewhere, and, sure enough, I stumbled upon it on the hard drive. We have plans for a Saving the Planet & Stuff e-book section at my website. I should say, I have plans. My computer guy will be surprised. I don't know whether the short story, Three Weeks with Walt and Nora, will end up there, or, since it's a bit lengthy, if we'll publish it for e-readers, too. Eric Bloom is my cover artist, and you'll be hearing more about him at some point in the future. In addition to providing the basic illustration, he also took care of the titles and cover layout. This is a big deal because, it turns out, there are copyright issues related to fonts. Eric worked those out for us. We are very, very happy with Eric at Chez Gauthier. We have learned a few surprising things while working on this project. In addition to the font copyright business, ISBN numbers must be purchased, and we'll need one each for the Kindle and Nook editions. Why is this surprising? Because in the past my publisher took care of all these things for me. I have a little bit of anxiety about whether or not there are other things G.P. Putnam's Sons did for me that I know nothing about but will need to do for myself. No doubt I will find out.